Stunning Birthday Flower Bouquet Card. A gorgeous Birthday card features a raised panel with the image of a flower bouquet, decorated with ebony butterflies, jeweled flowers, finally layered with chiffon and velvet ribbons, this combination makes a stunning design. 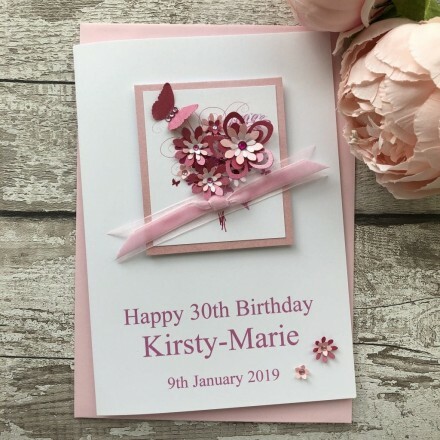 This handmade birthday card is teamed with a matching square envelope, protected in a sealed cellophane bag and sent to you in a double board outer envelope to ensure it arrives in pristine condition.